A shot from the point, the puck squeezing through the goaltender’s legs then slowly skidding through the side of crease, a player seemingly coming out of nowhere, diving headfirst and knocking it toward an empty net. The longest championship game in the state tournament's 67-year history -- 80 minutes, 43 seconds of elapsed time -- was over. 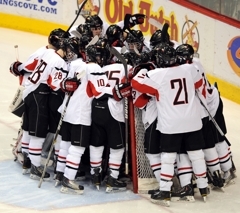 Eden Prairie defeated Duluth East 3-2 in triple overtime on Saturday, March 12, to win the state Class 2A title for the second time in three years. Or, more importantly, by whom? As the mob scene of Eden Prairie players celebrating along the boards grew larger and larger, obscuring the hero racing and leaping along the glass, thousands of fans at the Xcel Energy Center turned to each other and wondered aloud who had just ended a game for the ages. It was natural question. And, as it turns out, a silly one. Rau scored after a slap shot by his twin brother, Curt, tricked through Duluth East senior JoJo Jeanetta’s leg pads. The puck spun in the crease until the diving Rau made contact with it. It hit the left goalpost and bounced straight back in front of the goal. Replays show Rau's stick about to hit the puck a second time when it glanced into the net off Duluth East defenseman Andrew Kerr’s skate. Rau's goal capped one of the greatest careers in state high school history and will be required footage for every forthcoming "best of" state tournament highlight reel. 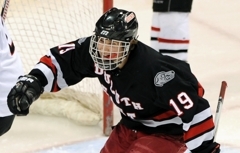 “They have the best player in high school hockey, Mr Hockey in my mind, (and he) scored the winner,” Duluth East coach Mike Randolph said about Rau, who finished the season with 41 goals and 40 assists. “I have nothing but respect for that kid. He could go anywhere he wanted, and he stayed in high school hockey. During a Sunday in mid November, on the eve of the start of the high school season, Rau told his family and texted friends that he would not be playing for the Eagles. 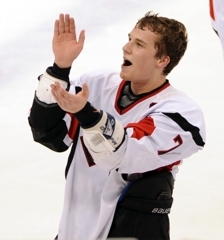 Instead, he had decided to play for the USHL team in Sioux Falls, S.D. The following day, Kyle had a change of heart. The first call he made to break the news he was staying at Eden Prairie went to Curt. Kyle had a gash on his chin and bruises around his neck, the residue of a game that, for the 5-foot-9, 160-pound center, might as well have been pinball as much as it was hockey. Rau, who had scored two goals in each of the Eagles' previous two state tournament games, was leveled on numerous occasions, most notably by Kerr, a sophomore who dished out several devastating hits. In a dramatic twist of fate, it was Kerr and Rau crossing paths again on the game's final play. Kerr attempted to knock the puck out of the crease, and partially whiffed, just before the sliding Rau arrived. "I kind of fed him a sucker pass when that No. 3 (Kerr) hit him,” Curt said. “I felt kind of bad for that one. The winning goal in triple overtime of a state title game? If Kyle Rau is playing, Kyle Rau is scoring it. Rau scored in double overtime against Wayzata in the Section 6AA championship game. He also scored with 5 seconds left in overtime to beat Class 1A runner-up Hermantown during the regular season. Through the two championship seasons Eden Prairie has had in a span of three years, the Eagles have had some roster turnover. 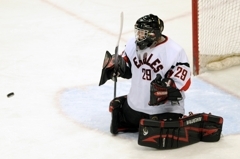 At one of the most pressured and magnified positions in the sport, one constant has been goalie Andrew Ford, who ended his senior season with his 19th win, leading the Eagles to the state Class 2A state championship over Duluth East on Saturday, March 12, at the Xcel Energy Center in St. Paul. Allowing just three goals in the tournament, Ford was a steady force for No. 1 seed Eden Prairie once again, this time, in the longest championship game in tournament history. 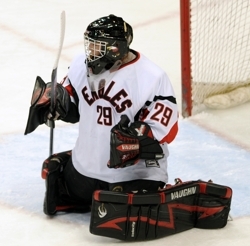 A rarity to have a sophomore starting, Ford backstopped the Eagles to the state title in 2009 and recalled the aura of the Xcel Energy Center when he first stepped on the ice. After the Eagles were knocked out in the section playoffs to Minnetonka last season, Ford had one more chance at the rare opportunity to be a starting goalie with two state championships. He backed that up with 29 saves in triple overtime against the Greyhounds. If Ford and the Eagles were going to grasp the state title once again, they would have to overcome a tough, perhaps fluke goal that went against them. Duluth East forward Trevor Olson scored the second of his two goals when he fired a shot that Ford made the initial save on. However, he was helpless as the puck fluttered in the air over his head and fell innocently into the net amidst his teammates diving to knock it out. Being down 2-1 in the third, Ford remained calm and did not add extra pressure to himself. He remained patient and waited for his team to tie the game. Even though Ford faced more shots in the overtime periods than his counterpart at the other end, JoJo Jeanetta, he was confident that his team would find a way to win. 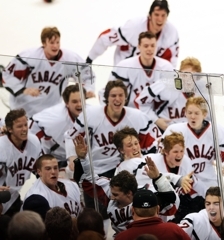 Eden Prairie was able to remain aggressive, not only in trying to tie the game, but in the overtime periods as well, which eventually ended when Kyle Rau dove to beat a Duluth East player to the puck and knocked in the championship goal. Ford’s play over the past three seasons have led to two state championships and a section final. The Eagles have not had much to worry about during his career in the crease. During his three years in an Eagles uniform, Ford compiled a 49-10-2 record, highlighted by a 16-1-0 stint in 2009. He was 19-4-2 this season with a 2.27 goals against, .900 save-percentage and four shutouts. Over his career, there haven’t been many times, if at all, his play has been in question. “I don’t think in the three years that I have coached him that I can count five bad goals that really went in on him,” Smith said. It’s often said that history never remembers the loser. History will make an exception this time. In the longest game in the history of the Minnesota state high school hockey tournament championship, top-seeded Eden Prairie claimed a 3-2 triple overtime victory over third-seeded Duluth East. The two powerhouse programs traded punches for 80 minutes, 43 seconds before Kyle Rau ended it with a diving poke that bounced off the post, off defenseman Andrew Kerr’s skate and into the ‘Hounds net. 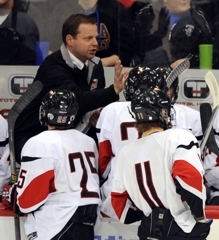 “Somebody had to win and somebody had to lose,” said Duluth East coach Mike Randolph after the game. “We’re the loser, but we’re not losers. “I think they’ll remember the Greyhounds." So will a battered Eden Prairie team. Rau’s chin was bloodied and bruised in the post-game media conference, but he had nothing but respect for the effort East gave. Twice the ‘Hounds took a one goal lead on Eden Prairie. Twice the Eagles rallied to tie it. And into the night the game ran on. “That’s all you can ask, that your kids lay it all on the line,” Randolph said. During his 23 years, Randolph and the ‘Hounds have been involved in several of the most memorable games in state tournament history. They won titles in 1995 and 1998 and finished as runners-up in 1991, 1997 and 2000. But it was a Class 2A state semifinal game in 1996 that most came to mind Saturday night, as history provided a harsh bit of symmetry. Former Greyhounds’ star Dave Spehar, who as a senior lost a memorable five-overtime state semifinal to Apple Valley in 1996 -- a game that remains the longest in state tournament history -- addressed the team before Saturday night’s tilt. Neither Randolph nor Spehar – nor the rest of the hockey-crazed state – forgets that 1996 game. 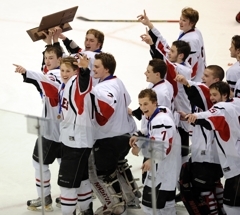 Neither will this year’s Duluth East team be relegated to history’s dust bin, forgotten by time. Saturday night’s game will surely continue on in the lore of the tournament, as will the ‘Hounds place in it. A diving, rebound goal from Kyle Rau gave Eden Prairie a 3-2 victory at 4:43 of the third overtime period of Saturday’s Class 2A boys’ hockey championship game at Xcel Energy Center in St. Paul. Saturday marked the first time in 67 years of the state tournament that a championship game went to three overtime periods. The last big-school or one-class championship game to be decided in overtime was in 1989 when Bloomington Jefferson beat Rochester John Marshall. In addition, the Greyhounds and Eagles needed overtime to decide their regular season meeting, a 4-3 Greyhounds victory. 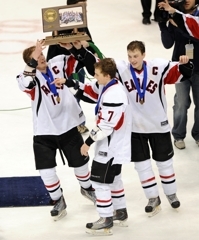 Saturday’s state championship is Eden Prairie’s second in three seasons. 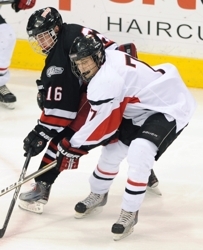 The bulk of the Eagles’ seniors on the ice Saturday played key roles in winning the 2009 title. 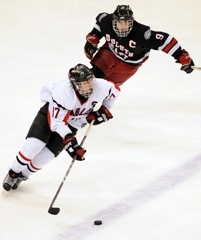 Standout Eden Prairie forward Kyle Rau scored twice in the third period of the first Duluth East game. On Saturday, he was held off the scoresheet until the final moment. He dived to get a stick on the rebound of his twin brother Curt’s shot from the point. The puck got behind goaltender JoJo Jeanetta and Rau won the race to the puck, getting his stick on it and knocking it over the goal line. 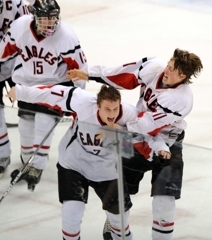 Eden Prairie’s other set of twin brothers, David and Mark Rath, forced overtime with third-period goals. Eden Prairie’s David Rath tied the score 2-2 at 14:04 of the third period. Defenseman Nick Seeler shot a puck from the point that Duluth East Jeanetta couldn’t control. Rath reached around Jeanetta and stuffed the rebound home to give his Eagles a lift. Eden Prairie outshot Duluth East 10-4 in the third period. Duluth East’s Trevor Olson scored his second goal of the game to give the Greyhounds a 2-1 lead at 9:31 of the third period. Rau attempted to disrupt the shot, but instead sent the puck fluttering toward Eagles goaltender Andrew Ford. A deflection off Ford’s blocker sent the puck up and over him and into the net. Duluth East grabbed a 1-0 lead at 3:31 of the second period on a power-play goal from Trevor Olson. Precision puck movement around the perimeter created a lane for Jake Randolph. He sent the puck from one faceoff dot to the other where Olson waited to drive it home. Grabbing an early lead was a much-needed boost for the Greyhounds, who came into Saturday’s final after playing a combined three overtime periods in victories against White Bear Lake and Edina. The Greyhounds might have cashed in on their second power-play opportunity in the second period, but Eagles defenseman Nick Seeler made two plays to keep the puck out of the net. Eden Prairie, which outscored its previous state tournament opponenets by a combined score of 10-1, could not muster a goal until the third period. Luc Gerdes took the puck off the boards, stick-handled around a Duluth East defenseman backhanded the puck into Jeanetta’s leg pad. Mark Rath got to the rebound and ripped the puck high into the net to the game 1-1 at 1:43 of the third period. Eden Prairie reached the state tournament thanks to a double-overtime victory against Wayzata in the Section 6 championship game. When storybook endings are written, they don't end any better than this. Rau, who returned for his senior season to win another state title with his Eden Prairie classmates, did just that. He scored the game-winner in triple overtime against Duluth East, diving head first to knock in a loose puck that had trickled behind goalie JoJo Jeanetta. 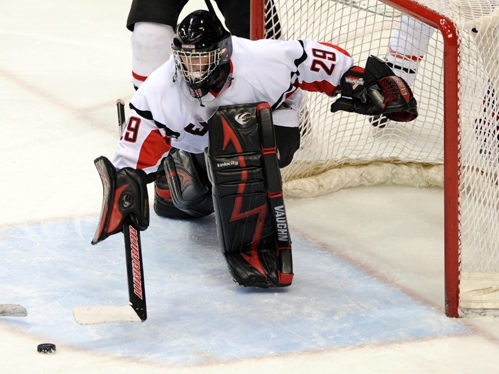 Ford stood tall under intense pressure from the Duluth East offensive attack, making 29 saves on 31 shots. The Frank Brimsek Award finalist as one of the top senior goaltenders in the state, Ford won his second state title with his performance. Olson scored twice for the Greyhounds in the state final -- and each one gave the 'Hounds a lead. He ripped in a power play tally from a bad angle in the second period to give East a 1-0 lead, then bounced a shot off goalie Andrew Ford's shoulder midway through the third to regain a one-goal lead. The senior, whose rise with the Hawks coincides with their ascension as a Class 2A force to be reckoned with, is the first defenseman tapped for the award in a decade.